"It was clear it would be difficult, they are obviously a top side," said Liverpool manager Juergen Klopp, who lost the 2013 final to Bayern when coaching Dortmund. "For me it's nice, going to Germany." While Bayern is third in the Bundesliga, Liverpool leads the Premier League. 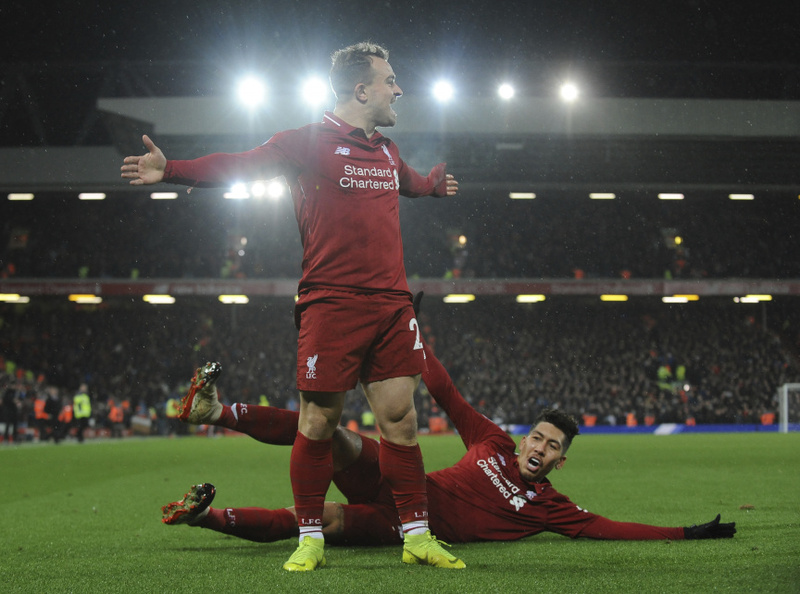 Two goals from former Bayern winger Xherdan Shaqiri lifted Liverpool to a 3-1 win Sunday over Manchester United. "They're the team of the hour. They're the league leaders in England," Bayern sporting director Hasan Salihamidzic said of Liverpool. "They play good football, they're very physical and they're full of energy. The first leg is at Anfield on Feb. 19 with the return match in Munich on March 13. Three-time defending champion Real Madrid was paired with Ajax. Madrid and Ajax have won 17 of those 63 titles those but have never met in a final. The potential first-time winners include Paris Saint-Germain, which will play Manchester United. The first leg is at Old Trafford on Feb. 12. PSG is the runaway French league leader and won the toughest group ahead of Liverpool and Napoli, scoring a tournament-high 17 goals. Man United's loss at Liverpool left it in a distant sixth place and playing the kind of soccer under manager Jose Mourinho that is almost unrecognizable from its traditionally fearless attacking style. "We're obviously not playing well at the moment," former United player Denis Irwin said at UEFA headquarters after the draw. "But we have got some fantastic players and a coach who knows how to win, and knows how to win this competition." In other matches, Barcelona was drawn with Lyon, Serie A leader Juventus will take on Atletico Madrid and Porto will play Roma. Man City, also seeking its first title, arguably got the weakest opponent on current form. Schalke is in 13th place in the Bundesliga. "I would like to play on Wednesday, but I can't, so we have to wait for February," Man City sporting director Txiki Begiristain said, noting Schalke has a three-week break coming up. "They have the time to rest. Let's see how they are in February, and how we are." Months after leaving Real Madrid, Cristiano Ronaldo will return to the Spanish city with Juventus for the first leg against Atletico. The final on June 1 will also be played at the Metropolitano Stadium in Madrid. Eight teams which placed third in their Champions League groups entered the Europa League draw. Napoli and Inter Milan only have to cross the Italian border into neighboring countries to face Zurich and Rapid Vienna, respectively. Arsenal will travel to Belarus to face BATE Borisov. Chelsea, the 2013 champion, is at Malmo, while five-time champion Sevilla is first at Lazio.